Background: Offering financial incentives is an effective intervention for improving adherence in patients taking antipsychotic depot medication. We assessed whether patients' motivation for treatment might be reduced after receiving financial rewards. 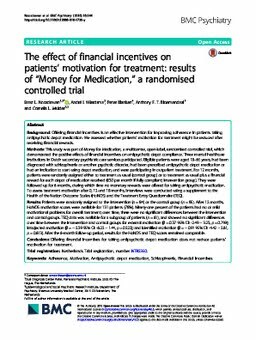 Methods: This study was part of Money for Medication, a multicentre, open-label, randomised controlled trial, which demonstrated the positive effects of financial incentives on antipsychotic depot compliance. Three mental healthcare institutions in Dutch secondary psychiatric care services participated. Eligible patients were aged 18-65 years, had been diagnosed with schizophrenia or another psychotic disorder, had been prescribed antipsychotic depot medication or had an indication to start using depot medication, and were participating in outpatient treatment. For 12 months, patients were randomly assigned either to treatment as usual (control group) or to treatment as usual plus a financial reward for each depot of medication received (€30 per month if fully compliant; intervention group). They were followed up for 6 months, during which time no monetary rewards were offered for taking antipsychotic medication. To assess treatment motivation after 0, 12 and 18 months, interviews were conducted using a supplement to the Health of the Nation Outcome Scales (HoNOS) and the Treatment Entry Questionnaire (TEQ). Results: Patients were randomly assigned to the intervention (n = 84) or the control group (n = 85). After 12 months, HoNOS motivation scores were available for 131 patients (78%). Ninety-one percent of the patients had no or mild motivational problems for overall treatment; over time, there were no significant differences between the intervention and control groups. TEQ data was available for a subgroup of patients (n = 61), and showed no significant differences over time between the intervention and control groups for external motivation (β = 0.37 95% CI: -2.49 - 3.23, p = 0.799); introjected motivation (β = - 2.39 95% CI: -6.22 - 1.44, p = 0.222); and identified motivation (β = - 0.91 95% CI: -4.42 - 2.61, p = 0.613). After the 6-month follow-up period, results for the HoNOS and TEQ scores remained comparable. Conclusions: Offering financial incentives for taking antipsychotic depot medication does not reduce patients' motivation for treatment.